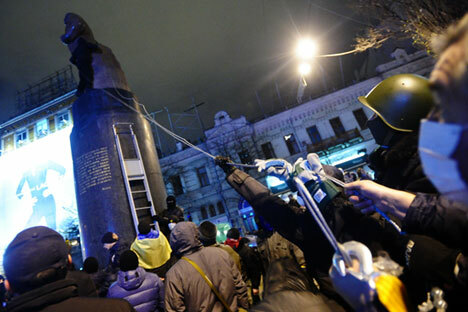 Protesters try to dismantle a statue of Lenin in Bessarabska Square. Kiev. Dec.2, 2013. RBTH presents a selection of views from leading Russian media on international events, featuring reports on plans by the Kiev authorities to take down Soviet memorial plaques, the possibility that FBI advisors may be sent to Egypt to join the investigation into the Sinai plane crash, and talks between Kuwait and Russia in Sochi. The Svobodnaya Pressa newspaper reports that Kiev's mayor's office soon intends to dismantle 79 memorial plaques from the Soviet period under a de-Communization law. A plaque dedicated to Soviet Marshal Georgy Zhukov on the Ukrainian Defense Ministry building is on the list of objects to be liquidated. "During the Civil War in Russia Zhukov participated in the repressions of several peasant insurrections (1920-1922). Military criminal," said the city authorities, explaining their decision. "All sorts of things took place during the civil war," said Mikhail Myagkov, scientific director of the Russian military-historical society. "But no one fought against any nationality since it was a social war between the rich and the poor. It is nonsense that Zhukov fought against the simple folk. Zhukov fought for the Soviet government." "And actually, he did a lot for Ukraine," he continued. "When we speak about how long the heroic defense of Ukraine's capital lasted, we must first of all remember Zhukov, who was general at the time and fought in the southwest. And after the death of General Batunin at the hands of the Ukrainian nationalists led by Stepan Bandera Zhukov headed the first Ukrainian front. It is thanks to him that a significant part of right-bank Ukraine was liberated." "The current Ukrainian government wants to erase from the people's memory everything that doesn't suit the authors of the new ideology – the ideology of Ukrainianism," said Igor Shatrov, deputy director of the National Institute of the Development of Modern Ideology and political analyst. "They are ready to rewrite history from the very beginning in order to show "the special destiny" of the Ukrainian people, which after "centuries of suffering, ordeals and deprivations, finally obtained its freedom," he said. The online newspaper Gazeta.ru reports that the FBI may join the investigation of the Russian airplane crash on Egypt’s Sinai Peninsula. On Nov. 10 Egyptian Foreign Minister Samekh Shoukry announced that FBI agents may be involved as advisors. According to the minister, Cairo has "received a proposal to participate in the investigation from the Americans and immediately approved it." The matter deals with a team of aircraft engine experts. Their participation is based on the fact that the engines of the crashed A321 are produced by an American company, Pratt & Whitney. When asked if FBI representatives will be among the experts, Shoukry responded that according to international rules, the U.S. can send all types of specialists for the investigation. "They can employ the services of any advisors they need to carry out the function. They need to have full access to the location of the catastrophe," he said. The U.S. Transportation Security Administration is currently waiting for detailed information from Egypt about the A321's engines. The centrist daily Nezavisimaya Gazeta reports that for the first time since the fall of the Soviet Union, a Kuwaiti emir came to Russia on Nov. 10. Emir Sabah Al-Ahmad Al-Sabah met with Russian President Vladimir Putin in Sochi, where Rosoboronexport, Mintrans and Gazprom signed a series of memorandums of intent with Kuwait. Media sources also report that the Kuwait military showed interest in buying Russian tanks, anti-aircraft systems, fighter jets and helicopters, writes Nezavisimaya Gazeta. Leading Middle East expert and director of the London Institute of Global Strategy Mamun Fendi told journalists that "Kuwait supports Russia's stabilizing role in the Middle East. Kuwait considers Syrian President Bashar Al-Assad a transitory figure and only the Syrian people have the right to decide his fate. In this the Russian and Kuwait positions coincide." According to the publication, the Syrian operation has forced Russia to side with one of the camps in the confrontation between the Sunnis and the Shiites, supporting the latter, who are both Syria and Iran's leaders. Now Moscow has to look for allies among the various conflicting forces, convincing them of the economic and political expediency of partnership. Egypt air disaster: Are Russia and the West now in the same boat?